Carl Casper is a chef in a rut. He’s been living on his reputation for the last ten years. 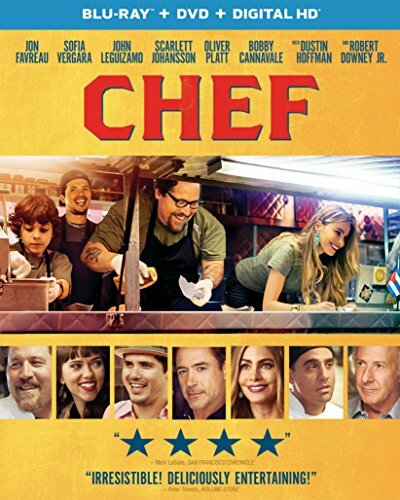 A famous local critic (the same critic that one can say catapulted his career ten years earlier) pays Chef Casper a visit and delivers a scathing review sending the chef on a journey to rediscover his love and passion for his culinary art. Add in the strained relationship between Chef Casper and his son and you have a potential heart warming, hunger inducing, and dancing in your seat good time. Chef Casper is the Master Chef at a famous Los Angeles restaurant owned by Riva (Dustin Hoffman). On the evening that famed local food critic Ramsey Mitchell (Oliver Platt) is set to make a visit, Casper and his crew, including Martin (John Leguizamo) and Tony (Bobby Cannavale), set out to introduce a brand new menu. Much to Casper’s dismay Riva demands that they stick to the menu that their clientele has enjoyed for the last ten years. Casper relents and proceeds to get lambasted by the critic, citing Casper’s lack of growth and boring ten-year-old menu. Meanwhile Casper and his son Percy (Emjay Anthony) share in a strained relationship that shows Percy wanting nothing more than to spend time with his father and even hopes that Casper and his ex-wife Inez (Sofi Vergara) can get back together. In a bonding father and son moment, Percy shows his father how to use Twitter. Casper takes to Twitter to tweet a private message to the famous food critic, replying to his review, and later finds out he sent it out publicly. This causes a bit of a twitter feud and eventually leads to a challenge from Casper to the critic to come back to the restaurant for a new menu. Riva gives Casper an ultimatum to either stick to the menu or quit. Casper quits, thus sending him on his journey to rediscover his lost passion for cooking. The journey includes a food truck, his son, his former co-worker, and a cross-country trek from Miami to LA selling Cuban sandwiches. All of the acting is superb. Favreau does a great job as a chef, really selling his culinary skills and paying attention to detail. He also does a very good job portraying a self-conscious but loving father. His lack of self confidence as a father mixed with the time and effort he puts into his craft makes Casper appear paternally impaired. Through food and his sons dedication to making their relationship work Casper is able to redeem himself. The food will have your mouth watering but I have to give a special mention to the music. The soundtrack was absolutely spot on! The mix of jazz, R&B, and Blues definitely had me dancing in my seat and fit in with the different locales. This is an overall excellent movie that I would definitely recommend.